Athena has a home! - Rocky Mountain Great Dane Rescue, Inc.
Athena has a home with her new family in Evergreen, CO! Athena will be the third Great Dane that Nancy & Garry have adopted from RMGDRI! This time they started off as fosters, and it was love at first sight with Athena! They knew immediately that she was going to be a permanent family member! 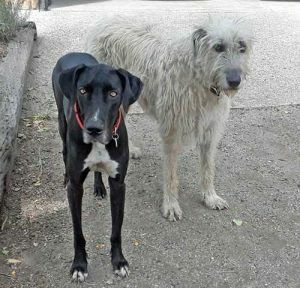 Athena shares her home with Sachi, a 5 year old Irish Wolfhound, and they have so much fun playing together outside. Both Nancy and Garry are home most of the time, so Athena will have companionship and belly rubs whenever she wants! We are so happy for Athena and her new family! Way to go sweet girl!